Exxel cut costs by using mobile cranes instead of a tower crane. 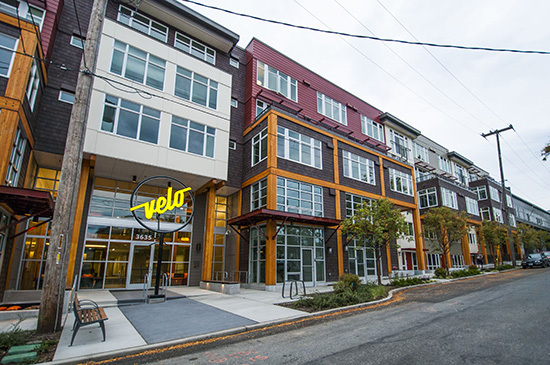 Velo is a four-story, 171-unit apartment building with 1.5 levels of below-grade parking. The 183,000-square-foot building includes a rooftop with an expansive commons area as well as landscaped courtyards, individual bike locker storage, a fitness area and a gathering room for social activities. Many value-engineering ideas were incorporated into Velo, including glu-lam beam-and-column facade elements that helped to preserve the original design intent and provided for sounder building-envelope details. To eliminate tower-crane costs, Exxel opted for mobile cranes, also saving money on city street-use fees. Exxel also performed remediation for Pacific Heating Oil Co. headquarters, previously located on this site, without incurring any schedule delays. A key project challenge was construction of the north exterior wall, which had only 6 inches of separation between it and the adjacent building. Exxel decided to fully weatherproof and clad the wood-framed walls while laying down on the structure as it was built floor-by-floor. Well-coordinated crane picks and sacrificial rigging were utilized to safely stand these over-10,000-pound walls. Exxel also utilized electronic as-built technology where plan sections and details are hyperlinked together, similar to website hyperlinks. RFIs and ASIs were posted to the electronic plan set daily, and electronic as-builts were available via FTP for all subcontractors and the owner use. Exxel’s monthly bulletins helped keep the neighborhood apprised of construction activities, which were also coordinated with the project across the street to minimize impact on the neighborhood. Exxel also utilized tablet technology to provide an efficient punch-list/close-out process for the project. Ultimately, the Velo project recorded over 142,000 worker hours and had no time-loss injuries.